Unless you have used one of the new epoxy or urethane/quartz-based grouts, sealing the grout joints is highly recommended following the cleaning. We use a water based penetrating sealer that has no odor. This commercial grade sealer provides a barrier against dirt and most stains. We ask that you allow the sealer to cure a full 48 hours before any liquids are allowed to contact the floor. You can walk on the tile once we are done cleaning, the floor will be mostly dry. We will use fans designed to blow air across the surface during the cleaning process. We recommend to avoid using the area for 30-40 minutes if the sealant is reapplied. Care should be taken to avoid the grout lines if they still appear wet. Frequency will depend upon your use, cleaning products used, and overall maintenance between cleanings. Generally 12 to 18 months would be a good recommended maintenance schedule for a kitchen. However, everyone’s tolerance and cleaning habits are not the same. If you are seeing a noticeable difference where you walk compared to the outside of the room, it may be time. 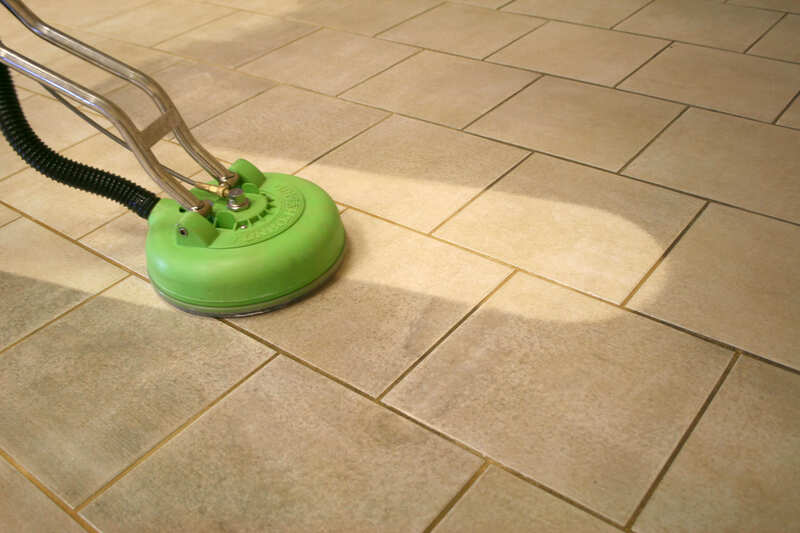 A good quality grout sealer can extend the time between needed cleanings by making it easier to maintain a clean appearance. Ceramic, porcelain, and glazed tiles can be cleaned and sanitized with vinegar (plain white) and water 1:1 ratio in between professional cleanings. This will also help in removing soap residues. Take care not to get this mixture on any metal for it is corrosive. Vinegar and other acids cannot be used on natural stones, which are more sensitive and require neutral cleaners. Blue Dawn® dish washing detergent is an old favorite for many when it comes to lifting dirt and oil. A few drops in bucket of hot water will create a mild but effective solution.